I really like the design of the new bigger leg, which is very close to the design of the old one but of course taller. 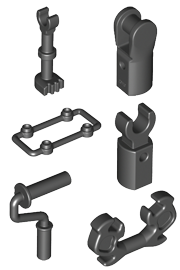 Affected by its size, the space between the feet, knee joint and the clip on top are bigger and allow to attach any kind of clip. The skeleton foot is still a bit distracting, but as with the shorter leg you can turn it to its backside when using it out of its purpose. The next fence design uses the helmet decoration (Element ID 6155122 | Design ID 11437) that comes in Black now. It took a while until I found a proper way to attach two of these parts in the way I had planned, and it is still very fragile, but I love the unique structure it allows. 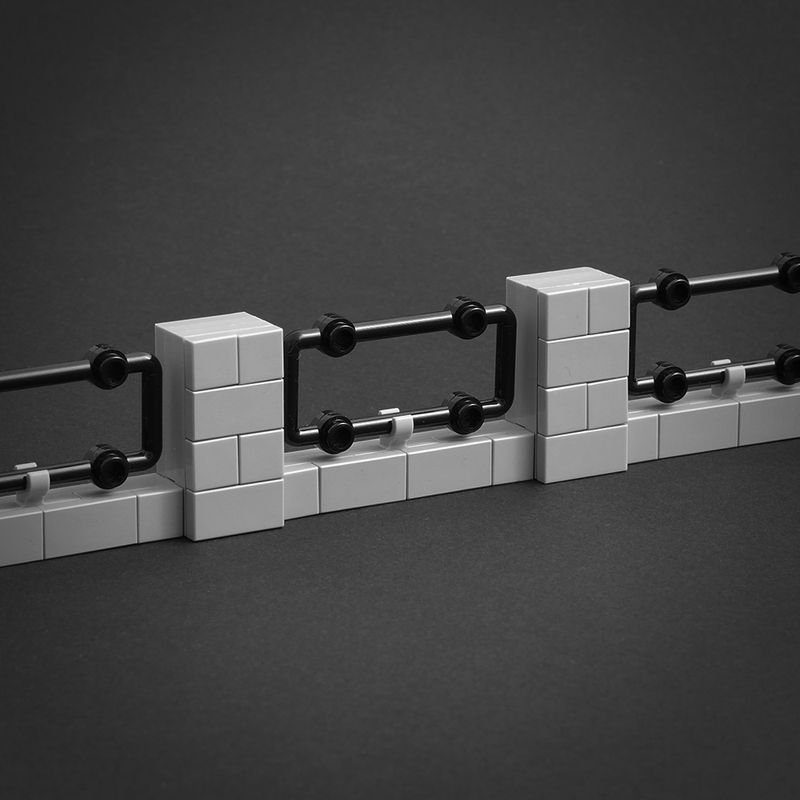 Central to the build is the new lattice 3x6 (Element ID 6138603 | Design ID 23444) which has a lot of potential in future builds and SNOT techniques, I think. 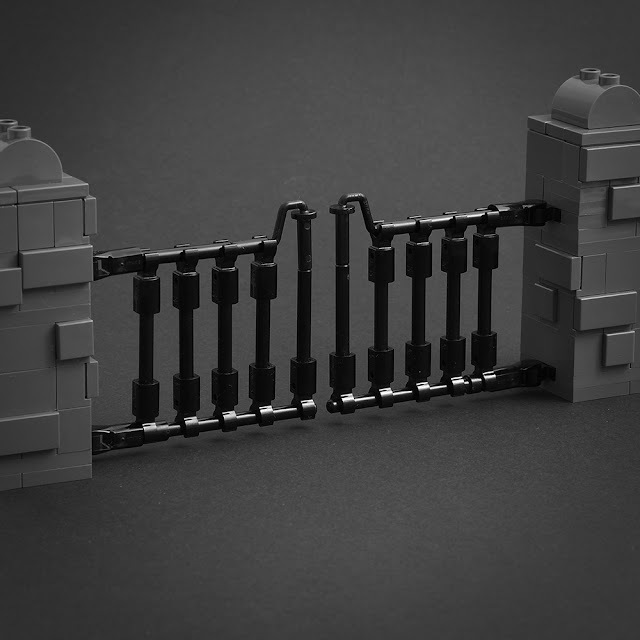 The LEGO Group themselves already made several moulds for fence pieces like the classic 1x4 fence (Element ID 3185) and the fitting gates. More recently they went with a new, more decorative gate design (Element ID 42448). 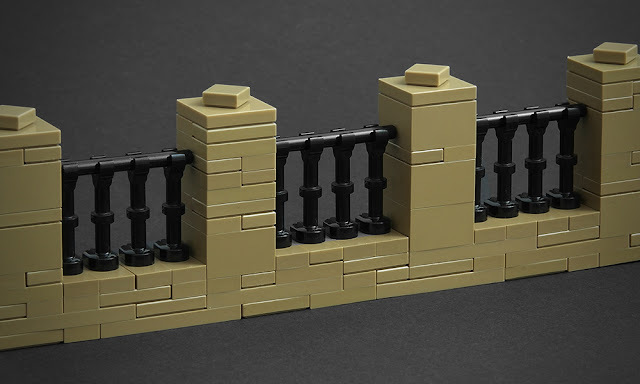 All these parts are great and look good, but with self-made fences you get a lot more variation, detail and uniqueness. Same goes for gates, so I made my own one too. Both bar holder with clip (Element ID 6015891 | Design ID 11090) and the new bar holder with handle (Element ID 6143318 | Design ID 23443) are used in the gate. While the ones with clip are holding the gate together, the ones with handle make perfect hinges. 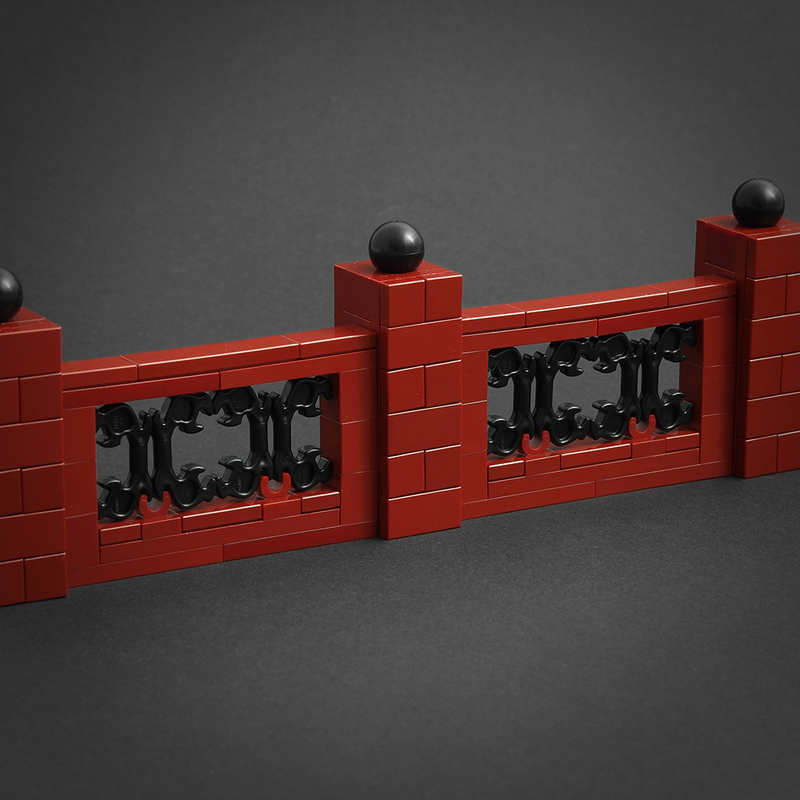 In addition the recoloured paint rollers (Element ID 6099599 | Design ID 12885) give the gate an interesting shape. I'm looking forward to use these ideas somewhere in the near future. I hope I have inspired you and we will see even more brick built fences. I love these articles, and your fence and stonework are impeccable. As a long-time AFOL nothing makes me happier than seeing pieces used in new and interesting ways to create elegant and unexpected forms. In future articles, where appropriate, it would be fun to also see some of your under-building techniques, especially on something like your wall. It would help illustrate how you built the core of your structure before you textured. I find that everyone approaches SNOT building from a different viewpoint, and it would be fun to see. Thanks Jonas!